“For thousands of patrons listening to a phonograph for the first time in the 1890s, the voice they heard coming out of the horn belonged to Dan W. Quinn. 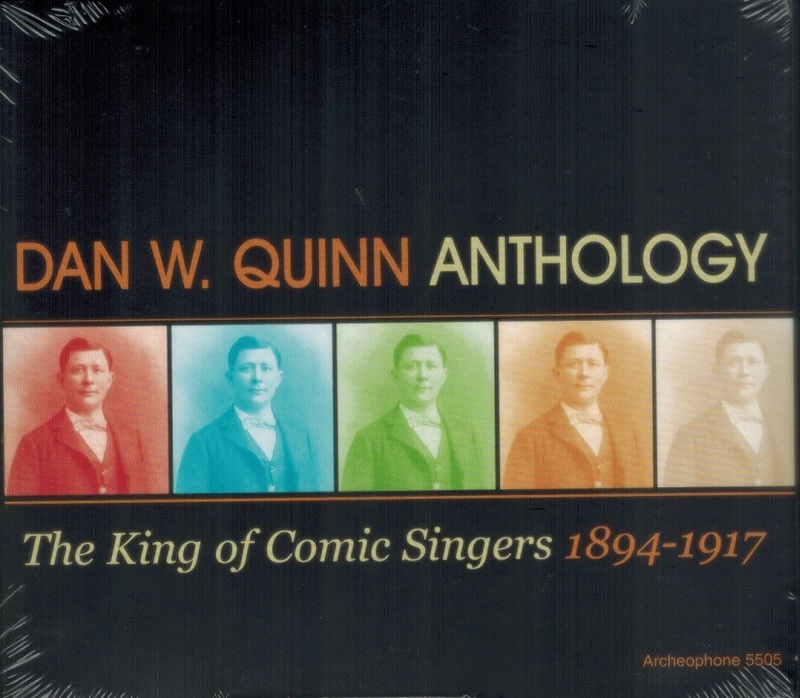 In an era when performers were seen as secondary to the song, early record buyers understood that the name Dan Quinn meant the record was a winner. He always brought the newest hits, sung with pep and consistent clarity, and he did so thousands of times for dozens of labels. 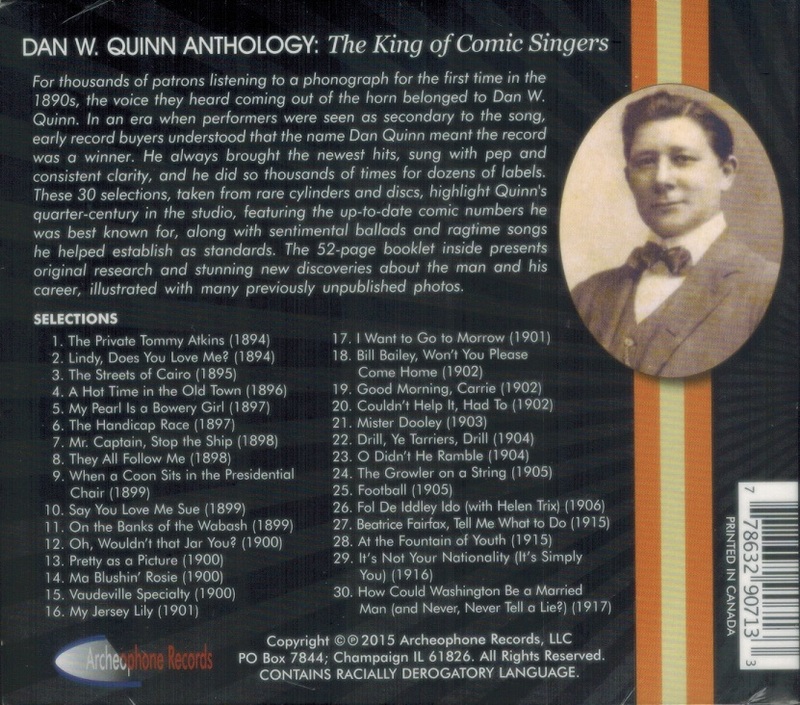 These 30 selections, taken from rare cylinders and discs, highlight Quinn's quarter-century in the studio, featuring the up-to-date comic numbers for which he was best known, along with sentimental ballads and ragtime songs he helped establish as standards. The 52-page booklet inside presents original research and stunning new discoveries about the man and his career, illustrated with many previously unpublished photos. Quinn recalled making his first test for the phonograph at a social club in Hoboken, January 1892, when the commercial recording business was only about three years old and fighting mightily for visibility. Hired by the New York Phonograph Company, and then by the United States Phonograph Company, Quinn quickly brought vitality to the new medium. He had amazing versatility and extraordinary stamina - meaning he could sing just about every kind of song hot off the publishers' presses and he could do so for hours on end, filling demand for records ‘by the round’ in those days before mastering technology. Dan made himself indispensible to all the record companies of the 1890s and familiar to consumers of phonographic entertainment. In 1896 Quinn estimated he had already sung 2,500 songs over about a five-year period, so choosing representative pieces for this collection has certainly been a challenge! We've gone back to 1894, almost to the very start, and followed his career forward to 1917, close to the end of the singer's career. Some of the best-known hits of the Gay '90s are here. He was a songwriter himself, too, and the 1894 selection, ‘Lindy, Does You Love Me’, shows what he could do with lyrical songcraft. 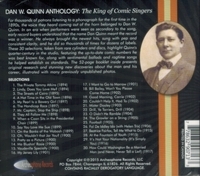 Once the industry switched to a system of making permanent masters, Quinn had less work to do but nonetheless put his definitive stamp on early 20th century classics from recording after 1906, Quinn made a comeback in 1915, recording ‘Beatrice Fairfax, Tell Me What to Do’ and ‘At the Fountain of Youth’. The old-timer was hired by all the new companies that sprang onto the scene in the late 1910s - Gennett, Paramount, Operaphone, Rex, Majestic and others—before quitting for good around 1918. Besides the obvious ‘hits’, ANTHOLOGY presents Quinn's versions of ‘Drill, Ye Tarriers, Drill’, ‘Ma Blushin' Rosie’, ‘My Jersey Lily’, and ‘Football’. These are songs you've heard by other artists (such as Al Jolson), and now you get to hear Quinn's spin on them. With his charm and precision, it's easy to see why one company advertised about him that ‘His name is a guarantee of the record’. Other important tracks here display how Quinn worked for just about every company, including the American Talking Machine, the Brooklyn Phonograph Company and the American Record Company. For Zonophone, Quinn recorded ‘Fol De Iddley Ido’ with Helen Trix, one of the very few duets he ever did. New research presented in the extensive notes accompanying the CD tell Quinn's story more thoroughly and accurately than ever before. Scarce details about his parents and siblings, his occupation as a young man, his wife and kids, and his breakthrough into the recording business are outlined here in Richard Martin's fascinating essay. Moreover, we challenge the traditional wisdom on Quinn's ‘quiet years’, when he worked as a booking agent in New York City. And, in true tabloid style: perhaps most intriguing of all are the revelations about Quinn's involvement in one of the most notorious scandals of the Gilded Age - the Seeley Dinner of December 1896, often called the world's first modern bachelor party (and certainly the first to be busted by the police). The 78-minute compact disc comes housed in an attractive, full-color digipak with a 52-page booklet that includes an essay, track notes, a full discography, and numerous photographs, news clippings, catalog images, sheet music, and other illustrations. Both the sound and print quality are first-rate. You'll barely believe you are listening to music made 120 years ago! In fact, the dozen brown-wax cylinder selections here are possibly the best of that medium you've ever heard.